Computer Weekly recently held an event to recognise the most influential women in IT. Find out the results of our Women in Technology Awards. 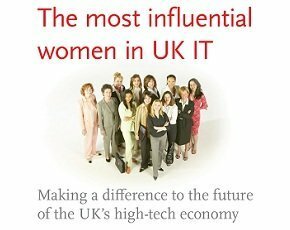 Computer Weekly is pleased to announce its latest annual list of the 25 most influential women in UK IT 2013. The aim of compiling an annual list of the top 25 most influential women in UK IT is to focus on the role of women in IT, recognise the most influential role models and discuss the vital part that female IT leaders will take in making a difference to the future of the UK’s high-tech economy. The 25 inspirational women who made it on to the 2013 list represent the role models that will be so important to the future diversity and success of the tech community. Joanna Shields is an American-British executive, currently serving as CEO and chair of Tech City Investment Organisation and as the UK government’s business ambassador for digital industries. Prior to this she was vice-president and general manager of Facebook in Europe. Before Facebook, she was president of people networks at AOL, a position she assumed after the acquisition of Bebo by AOL. At Bebo, she served as CEO, and prior to this she was managing director for Google Europe, Russia, Middle East & Africa. In February 2013, she was assessed as one of the 100 most powerful women in the UK by Woman’s Hour on BBC Radio 4. Read our exclusive interview with Tech City CEO Joanna Shields. Denise McDonagh took up the new role of Home Office CTO on 1 June, having previously been programme director for the government’s cloud computing scheme, G-Cloud. The cross-government G-Cloud programme is revolutionising the direction and procurement of IT across the UK public sector, as well as having responsibility for reducing the Home Office IT expenditure by 30%. McDonagh was also previously director of Home Office IT, and represents a new breed of leaders, enabling innovation and focusing on building high-performing teams of predominantly civil servant IT professionals. She has over 25 years’ experience in UK central government, including Defra and the Home Office, delivering high-profile IT programmes with budgets worth hundreds of millions of pounds. She is also the government representative on many of the senior supplier forums. She was awarded a CBE for services to IT in the Queen’s birthday honours list 2013. As the third Royal Mail CIO in less than 18 months, Catherine Doran inherited a controversial IT transformation programme, as well as the splitting off the Post Office as part of the reorganisation of the UK postal service. She is responsible for devising and delivering the IT strategy to transform the technology estate. She joined Royal Mail from Network Rail where she led a company-wide transformation programme. Wendy Hall is founding director – along with Sir Tim Berners-Lee, professor Nigel Shadbolt and Daniel J. Weitzner – of the Web Science Research Initiative, which was launched in 2006 as long-term research collaboration between the University of Southampton and MIT. She is a fellow of the BCS, the Royal Academy of Engineering, the Institute of Engineering and Technology, and the Royal Society. She became a Dame Commander of the British Empire in the 2009 UK New Year’s Honours list. She was also awarded a CBE in June 2000. Under Lesley Cowley’s leadership, Nominet has become a trusted guardian of a vital part of the UK internet economy, providing services that are relied on by millions of businesses and consumers. Cowley serves on the Nominations Committee and the Development Working Group. Respected within the international internet community, she is chair of Icann’s Country Code Names Supporting Organisation. She is an advocate for the multi-stakeholder model of internet governance, and represents Nominet at a range of national and global events and forums. Cowley was awarded an OBE for services to the internet and e-commerce in 2011. She is a Fellow of a number of respected bodies, including The Institute of Directors, the BCS, and The Chartered Management Institute. She is a freeman at The Worshipful Company of Information Technologists, a member of The Inspirational Women Network, a trustee of the Jenner Hall Trust and a STEM ambassador to schools. Cowley has been chief executive of Nominet since 2002. Angela Morrison has been CIO of Direct Line Group (DLG) – formerly known as RBS Insurance – for three years, managing business technology services, which shapes, builds, runs and governs IT for DLG. Insurance was a new sector for Angela Morrison, having previously spent 18+ years in food retail and IT, 10 of which were at director level and included being a member of Sainsbury’s operating board, where she was responsible for the insourcing of the IT function and its subsequent transformation to support the business’s recovery plans. Morrison started her career in a software house and spent seven years in IT/business consulting before joining Asda, where she held a number of director roles, including establishing its home grocery business, being CIO during the transition of systems from Asda to Wal-Mart and latterly as European strategy director for Wal-Mart. Martha Lane Fox is the UK’s digital champion and the founder of Go On UK, which she chairs. She is also chair of the Government Digital Service’s advisory board and sits on the Cabinet Office Efficiency and Reform board. Lane Fox co-founded Lastminute.com in 1998 and sold the business to Sabre Holdings in 2005. Chi Onwurah was elected at the 2010 general election as MP for Newcastle upon Tyne Central. Chartered Engineer and former head of telecoms technology at Ofcom, the UK telecoms regulator, she became the shadow minister for Business, Innovation and Skills (innovation, science and digital infrastructure) in 2010, and is now Shadow Minister for Cyber Security and Digital Government. She is co-chair of the Parlimentary ICT forum, PICTFOR and is board member of the Parliamentary Office of Science and Technology. Susan Cooklin is CIO at Network Rail. Her career has spanned over 20 years in financial services, leading business, technology and operational teams across global organisations. Last year, she took on the added responsibility for finance and HR shared services at the rail operator, which saw her team expand from 600 to 1,000 people. Cooklin ran a business change programme in the corporate banking division of Barclays, where she worked for seven years before joining Network Rail in 2006 as head of IT delivery. …and by a reader vote on ComputerWeekly.com. Polly Gowers, OBE, is CEO and founder of Everyclick. The company benefits charities through innovative technology – creating an additional £3.5m for them to date. Everyclick’s flagship product is Give as you Live, which enables online shoppers to raise money for charity without putting their hand deeper in their pocket. For each Give as you Live purchase the retailer pays a commission, a proportion of which is donated to the shopper’s chosen charity. The technology is free to any UK charity. Testament to the company’s success, Everyclick recently won the People’s Choice Award for Most Promising Internet Company at Internet World 2013. At the start of the year, Give as you Live was named Best Giving Platform at the Institute of Fundraising awards in January 2013, beating competition from JustTextGiving and Virgin Money. Gowers also sits on the Secretary of State’s Entrepreneurs’ Forum, assisted by the Women on Boards research by Lord Davies. In May 2012, she was awarded an OBE for services to UK philanthropy. Sue Black is a senior research associate in the Department of Computer Science at University College London, and has been widely acclaimed for her role in campaigning to save Bletchley Park, the home of the UK’s secret codebreakers in World War 2. She founded BCSWomen in 2001, which now has more than 1,200 members. Black also set up The <GoTo> Foundation, a non-profit organisation which aims to make computer science more meaningful to the public. Cathryn Riley joined Aviva in 1996 and is chief operating officer with responsibility for IT, business change and shared services across the group. She joined the group executive board in May 2011. She joined Commercial Union in 1996 and subsequently held a number of senior roles in its successor companies, CGU and Norwich Union. She served as operations director and retail director at Norwich Union and spent seven years in various executive roles within Aviva’s UK General Insurance business. She has also previously served as managing director of Norwich Union Healthcare, business services director of Norwich Union Life, chief operating officer Aviva UK Life, chief operating officer and chief information officer of Aviva Europe and UK commercial director. Lyn Grobler is the vice-president and CIO of IT strategy and corporate functions and alternative energy & shipping businesses at BP. With an extensive career in IT, she has been responsible for projects in banking, trading and energy environments for companies including ICL, Ralph M Parsons, Chase Manhattan Bank and Koch Supply and Trading. Grobler is a member of Women in Technology and leads the Women in IT&S group within BP. Gillian Arnold has 30 years’ experience in the IT industry, 22 of those years being with IBM. She has undertaken customer-facing technical, sales, business development, strategic marketing and consultancy roles. She proved her expertise in managing and establishing teams for new products, and building teams with cross-industry and cross-platform experience across Europe and the UK. Arnold has now retired from IBM. She has significant interest in encouraging more women into the science and technology sectors and has chaired a forum for IT trade body Intellect. She now sits on the board of directors for the UKRC for Women in SET and is currently chair for BCSWomen, which is part of BCS, the Chartered Institute for IT. Kate Craig-Wood founded Memset with her brother, Nick, in late 2002, leading the firm to become one of the UK’s top cloud and hosting providers. She chairs Intellect’s climate change group, as well as sitting on the trade body’s main and operations boards. Last year she also co-led the technical strand of phase two of the Cabinet Office’s G-Cloud and App Store project. Jacqueline de Rojas is vice-president and general manager, UK & Ireland, at CA Technologies. In this role, she is responsible for all aspects of sales, marketing and service throughout this important region. Her 25 years of experience in sales management is helping CA Technologies to grow revenues and extend the provision of IT management software and solutions across all IT environments. De Rojas joined CA Technologies in 2012 from McAfee, where her focus on new business in the enterprise and mid-market enabled McAfee UK & Ireland to swing from a business reliant largely on renewals revenues towards more focus on new business. Enabling this transition within just 30 months of her appointment, and other achievements, earned her McAfee’s “vice-president of the year” award. Prior to this, she was managing director, UK & Ireland, at Novell UK. De Rojas has also previously performed leadership roles at Cartesis, Business Objects, Legent and Informix. Aileen Allkins is the leader responsible for HP’s Software Support organisation and its credo of “Exceed Expectations”, a vision she developed over a career dedicated to IT support. Prior to HP, she held global leadership roles at Onyx Software and Peregrine, living in both the US and Europe. Her 25-year IT support career has seen the tools of IT support evolve from 5.25in DOS boot disks to high-speed broadband and community-based issues resolution. Now leading a team of 1,300 HP software support professionals, her goal is to eliminate corporate waste from misunderstood, unused or under-used software. Under her leadership, HP’s global support organisation aims to deliver consistently excellent support for HP customers, ultimately building support into a competitive differentiator for HP Software. Claire Vyvyan is general manager and executive director, large institutions, at Dell UK, and recently acted as general manager for Dell’s public sector business. She was previously director and general manager of Dell’s Commercial Business Group in the UK and Netherlands between 2002 and 2009. Prior to rejoining Dell in April 2011, Vyvyan was the global client director for BT Group at Microsoft, where she was responsible for Microsoft’s global business relationship with BT, spanning market partnerships to consumers around TV, music and gaming. She has also held sales management roles in the public sector and commercial businesses for Compaq and held several sales and marketing positions at Mars Group, including running Mars Electronics’ Northern European distribution business. Bernadette Wightman leads the largest channel sales operation for Cisco outside the US, with more than 2,000 registered partners transacting in excess of 90% of Cisco’s UK and Irish business. Since joining Cisco in 1999, she has held various positions including leading the UK and Ireland small and medium business organisation. Wightman is also executive sponsor for Cisco’s Connected Women Network, set up to inspire and attract the best female talent into the IT industry. She is a well-known figure and regularly speaks at conferences and events across the UK and Ireland. Take a look back at the top 25 most influential women from 2012. Cary Marsh launched Mydeo in 2005 following a government research and development grant for technical innovation. She has since gone on to raise over £500,000 in funding for her startup. Mydeo became the first and only service to be fully integrated into Microsoft’s Windows Movie Maker software. Mydeo now provides high-quality streaming video hosting to over 250,000 individuals, communities and businesses around the world. In October 2007, Mydeo announced that Best Buy, the largest consumer electronics retailer in the US with market value of over $20bn, was taking a minority equity stake in Mydeo, and would be using the Mydeo platform for its own bespoke video sharing service. Mydeo won a commendation in the Best Streaming Service category at the 2008 UK Internet Service Provider awards and was a Red Herring Europe 2008 finalist. Ursula Morgenstern has been the CEO at Atos UK and Ireland since January 2012, having previously held the role of chief operating officer. She joined Atos Origin in August 2004 as head of enterprise solutions and worked her way up. She was a partner at KPMG for four years and general manager at K&V Information Systems. Snap Fashion was founded by 25-year-old computer science graduate Jenny Griffiths in 2012. The business used the promise of Technology Strategy Board funding to attract private investors and develop its novel search engine. Since then, it has won the prestigious $175,000 Cisco BIG award and the Decoded Fashion startup pitch. It is now planning to launch an Android version of the app, a menswear version and to take its technology into other retail markets. Snap Fashion’s innovation and entrepreneurial spirit saw it beat 300 businesses to the 2012 Cisco British Innovation Gateway (BIG) award. The BIG award is a five-year initiative to encourage sustainable and scalable growth of innovative high-tech small and medium-sized enterprises. The search engine, devised with computer vision technology, uses colour, form and pattern to seek out similar items from among the products sold by more than 170 high street retailers. Lucy Dimes was appointed CEO of Alcatel-Lucent UK & Ireland in April 2011. Previously, she was managing director of Group & Openreach Service Operations at BT. She was also a member of the BT Operate executive board and BT Group equality & diversity board. Kirstin Duffield took the helm of Morning Data in 2006 and has led the company to its new development centre location and the introduction of the total support and systems package for clients who want a one-stop shop. She has spearheaded the company’s approach to client service and product support, combined with long-term cooperative relationships within the Morning Data community. Morning Data provides specialist software for the insurance industry.